Makar Sankranti is celebrated every year on 14th January all over Kumaon with great élan. Makar Sankranti is the festival of hope and new beginning. It is a major harvest festival and considered very auspicious because on this day, the Sun ends its southward journey (dakshinayan) at the tropic of Capricorn and starts moving northward (uttarayan) towards the tropic of cancer. The movement of the Sun from one zodiac sign to another is Sankranti, and Makar is Capricorn. Makar Sankranti signifies that we move from the darkness of ignorance towards the light of true knowledge. In Kumaon, fares are held, cultural events are organized and traditional sweets with sesame seeds (til) are prepared at home. Keeping the family tradition going, I prepared sesame seed sweets with a little twist. I added desiccated coconut and used condensed milk to prepare them. 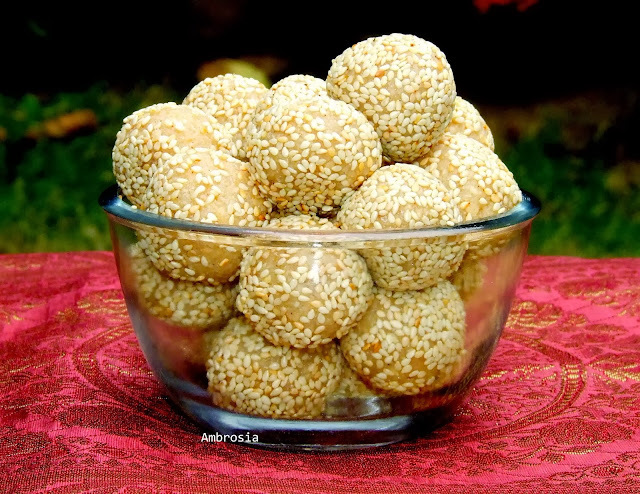 Traditionally, sesame seed sweets are prepared with Jaggery. Roast sesame seeds in a thick bottomed wok over low flame till the seeds become light brown and a sweet aroma emanates (roast over low flame stirring constantly. The seeds burn very fast). Keep the roasted seeds for ½ hour to cool completely. Reserve ½ cup of the roasted seeds to roll the balls. Powder 2 cups sesame seeds coarsely. In a thick bottomed steel, wok add ground sesame seeds, desiccated powder, and condensed milk. Cook over low flame stirring continuously till the mixture begins to thicken. Add nutmeg powder. Turn off the heat when the mixture begins to leave the sides and comes together like a big ball when stirred. Roll out medium size balls (laddus) and toss them in the sesame seeds. Happy Makar Sankranthi to you Namita. Those ladoos looks perfectly shaped. Love the way they are sitting in that bowl waiting to be picked! 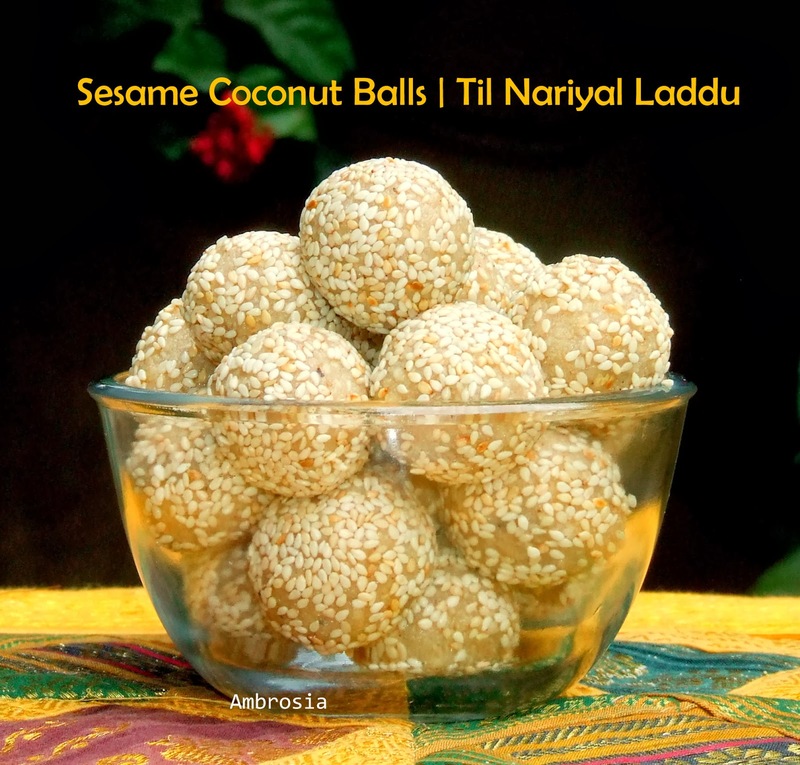 Sesame seeds with coconut sounds nice and am guessing were soft The jaggery ones are a little too hard for me. Happy Makar Sankranti to you and your family. The ladoos are so perfect and have your added healthy twist to it. They look super Namita!! I am partial to both sesame seeds and coconut. Greetings on Sankranti to you and family.